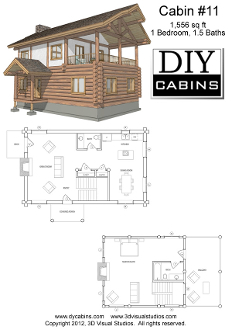 Log Cabin #11 is a 1,556 sq ft cabin with 1 bedroom and 1.5 bathroom. Cabin number 11, or is we like to dub it, "The Chalet" is one of our personal favorites. This 2 story cabin is simplistic in its structure, yet has a lot of space to offer, wrapped in the look of a Swiss chalet. We broke away from the "traditional" cabin style/look and combined log, frame and post and beam styles, all under one roof.